In Basketball, there is a concept of the Triple Threat Principle. Being a principle, it applies to any player, playing any position, operating in any offensive set, against any defense. The principle is always there and always the same. When you receive the ball, and before you put it on the floor, you are in what is known as the Triple Threat Position. From this position, you can either penetrate (dribble), pass to a teammate or make a scoring attempt. When you pick up your dribble, you are no longer a triple threat as your only options are passing or scoring. The implication of this principle is that when you are in the Triple Threat Position, you have more leverage over your defender than when you've already picked up the dribble. The Triple Threat Principal, when applied to Ultimate, allows a thrower to be in a better position to control the defenders because it puts added emphasis on the player's ability to attack in a variety of different ways from the same basic starting point. The Triple Threat position in ultimate (the TRUE Power Position) becomes viable when a player is able to begin Dribbling. The beauty of applying this philosophy in Ultimate is that a player who understands this is always in the triple threat, they always are a legitimate threat to penetrate. Shown here on the right is the triple threat stance. In this position, the hips should be square, the shoulders should be square and the feet should be square, all directed towards your target. Balance should be spread evenly across both legs with knees slightly bent. With your ability to attack the defense with so many different throwing options at once, it will make any one of your throws easier to get off since the defender is preoccupied with having to defend so many things simultaneously. From here, you can pivot (front pivot and back pivot) and look to be able to follow your throw in any direction. As you pivot back and forth and extend in different directions to get the defender off balance, you should always try to transition back to this balanced stance and spend the majority of your time poised and ready to attack. Always place an emphasis of catching the disc like this, with both hands on the rim and thumbs on top and if the disc cannot be caught like this, at least transition into this grip/stance as soon as you can. "Pancake" style catches should be discouraged and used as little as possible. From the triple threat position, a thrower can quickly and readily deliver at least a dozen different 'right-side up' passes including both right and left hand versions of: Backhand Lift, Skyhook Push Pass, Backhand Airbounce, Sidearm Lift, Push Pass, Sidearm High Release, Standard Sidearm and Standard Backhand. Not only does your defender have to be prepared to guard against each of these throws, but when you add in the threat of penetrating in any direction at any time, you've got significantly more leverage over your defender compared to the conventional stance. In this photo, you can see that this player is a threat with only a couple of throws and is in no position to be a threat of any kind with regards to dribble drive penetration. It's much more favorable conditions for a marker/defender to aggressively defend against this type of stance. Additionally, since this player doesn't play with a penetration based philosophy that provides a certain amount of leverage over the marker, he's forced to compromise his throwing mechanics in an effort to throw around the marker. Flawed mechanics rob you of power, consistency, quickness and accuracy. The important thing to remember about the triple threat principal is that it's a different way of thinking, not necessarily a different way of playing (although your play should be dependent on the way you think). Once you start thinking about controlling the defense with an arsenal of different threats, the game gets easier and even more fun. It lets the game 'come to you'. Shown here on the left is a player in the triple threat position as defined in basketball. In hoops, when you are in the triple threat position, you can either 1) shoot, 2) pass or 3) dribble. In the triple threat in basketball, the defense needs to be able to defend against each of the three possibilities. When the basketball player picks up the ball after dribbling, he is reduced to a double threat and therefore defenders can play more aggressively. In Ultimate, the three threats are 1) throwing into the endzone for a score, 2) passing the disc to a teammate or 3) dribbling. The advantage you have in Ultimate that you don't have in basketball is that you never 'lose the dribble' and get reduced to a double threat. In Ultimate, you can always penetrate. While it could easily be argued that passing to a teammate and passing for a score are the same thing but in my line of thinking, there is a significant enough difference between the two to draw a distinction. If you think about it, when you are marking a thrower, there is a distinct difference in how you defend when a player is attempting to throw for a score and when they are simply passing to a teammate. Compare this stance in basketball which is commonly seen as a fundamentally sound way of breaking down a defense and the stance of the player above. The two stances couldn't be any more different. The following photos are classic examples of the types of improper and inferior body mechanics employed by so many players. As you can see in both the backhand and sidearm examples, the hips and legs are almost completely neutralized as part of the throwing motion. In both of these throws, it would be virtually impossible for either player to penetrate after throwing the disc and in fact, they are so far off balance it would take them a moment just to get their balance back on both feet again. Since so much weight is placed upon the non-pivot foot in these cases, players often times commit traveling violations since there is so little pressure being placed on the pivot foot. Here, a player is throwing a backhand around the marker. The hips appear to be pointed at least 90 degrees opposite from the direction of the throw. He probably traveled (lifted or slid his pivot foot) before the release of the disc and his center of gravity, which should be somewhere over his pivot (left) foot is at least 28 inches off center. Imagine someone shooting a basketball with this kind of body mechanics, just because there is a defender in his way blocking his motion. Here, a player throws a sidearm (a.k.a. a forehand or forearm). As you can see, his shoulders and neck, rather than being square are tilted almost 70 degrees, his head is off 45 degrees and his hips are tilted around 20 degrees. To compensate for this, other joints in the body all have to be adjusted to get the throw off flat (you can actually see that the throw isn't flat and does sail off to his right, as his shoulder alignment would dictate). While it appears that in this instance, the thrower didn't commit a traveling violation, this type of stance lends itself to frequent travels. Again, his center of gravity is at least 28 inches off of where it should be, the hips don't line up with the throw, there is no power coming from the legs, ankles, hips or knees and again, it's impossible for him to throw and run in the same motion (penetrate). All of this making him easier to defend after the throw and basically unavailable to the rest of the offense until he's able to 'right himself and then beat his defender somehow. The easiest time to get open on your defender is as you're throwing the disc and yet in all three of these photos of players playing conventional ultimate, the thrower is off balance with very little in terms of a threat to explode off of their throw. Compare those two Ultimate photos above with the following photo of Sheryl Swoopes in the triple threat stance. Look how far off her 'marker' is because of her being forced to cover against the dribble, pass or scoring attempt. Which offensive player of the above photos do you think looks like they have the most balanced attack? Which player do you think has a better chance at controlling the defender and therefore be in better position to be successful, not only in delivering the pass or shot to the desired target but being able to follow up afterwards to remain an integral part of the team play on offense or defense? Between Swoopes and the conventional players above, which do you think possesses the mentality of dictating tempo and being in control of the defense? Are any of the ultimate players above doing anything to manipulate the defense? Or are they just beating the defenders with their athleticism and good looks? This isn't meant to suggest that a Frisbee can't be thrown with the types poor body mechanics shown above. They obviously can. You can also hit a golf ball from behind a tree if you have to make the adjustment but when you can use a normal swing, why would you tie yourself up in a knot. What I am suggesting and what I teach is that players don't have to be contortionists to be able to be successful and that by understanding proper throwing mechanics, an offense can be designed to augment a players throwing abilities, not hinder them. I like to compare the triple threat position in Ultimate to the stance a lion tamer would use to tame lions or how the stance a boxer uses. With right handed throws equating to the bull whip and left handed throws taking the place of the stool, you can easily tame most any defense. 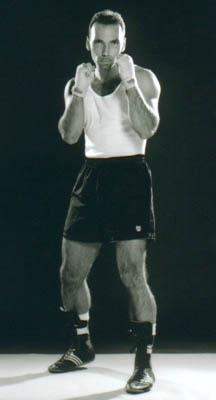 Similarly, in boxing, the boxer is upright, balanced and capable of attacking and counter-attacking with either hand. Certainly, there is no reason why any Ultimate player shouldn't at least be able to fake throws with either hand, not to mention at least being able to throw for short distances with both. If you took two identical twins, who went through life training the same, eating the same, attended the same schools, learning all of the same basketball skills, techniques, strategies and tactics and you educated one of them about the triple threat principle and the other had no clue about it. What kind of advantage would the twin with knowledge of the triple threat principle have? It wouldn't be a tactical advantage. It wouldn't be a strategic advantage. It wouldn't be phyiscal/athletic. It wouldn't even be an intellectual advantage. The advantage that the player who understands the triple threat principle vs. the player who doesn't is simply a mental advantage. A philosophical advantage. When you combine the art of dribbling in ultimate with the time tested triple threat principle of basketball, it creates a tremendous paradigm shift in the game. It changes just about everything that conventional ultimate is fundamentally built on. Just about every cut, every throw, every pivot, every strategy is invalidated once you understand the ramifications and implications of introducing these basketball ideologies into ultimate. However, don't take my word for it, go out and prove it to yourself. Learn to dribble, implement an offense that is based on dribbling and the triple threat principle, surround yourself with open-minded players who are interested in playing the game differently and you'll come to your own conclusions. In the process, what you'll come to realize is that the game is far more fun and joyful than you ever thought was possible! !